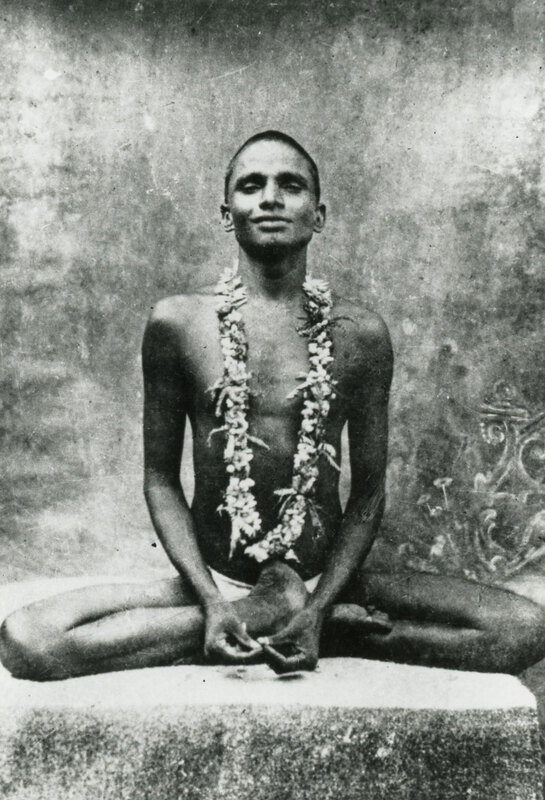 Nityananda lived from the late nineteenth century to 1961, making him one of India's most recent extraordinary saints. Nonetheless, information about his birth and early childhood is sparse and contradictory. It has been said that as an infant he was found in the Guruvan jungle by a harijan woman. This woman sold the baby to the childless Unniamma of Calicut, a simple woman who earned a small income by doing household work for Ishwar Iyer, a prominent solicitor. This kind, devout man took an interest in the youngster, who was named Ram by his adoptive mother. Upon her death, he assumed guardianship of the child. Nityananda liked to stand in trees and shower his devotees with gifts. Occasional remarks made by Nityananda through the years, however, support another version: protected by a large serpent coiled around him, the baby was found on a riverbank and cared for by the kind-hearted but poor Unniamma, here married with several children of her own. Ishwar Iyer, again Unniamma's employer, took the orphaned Ram upon her death. It is generally agreed that Ram, as he was then called, left his home with Mr. Iyer following a trip the two took together to Varanasi. He was then perhaps in his early teens and it is known that he traveled widely during this period. While it is impossible to reconstruct an itinerary, it is thought that he spent considerable time in the Himalayas and in many holy places in north India. When his foster father lay dying, Nityananda returned to Calicut to be with him. Following the funeral, Nityananda again departed for a period of wondering in south India, and stories exist of even more far-ranging travel: to Singapore, Malaysia, even Japan. Around 1910 stories begin placing the young Nityananda in the South Kanara district of North Kerala. This was a time of miracles and of growing recognition that an exceptional being was present. Historically, Nityananda was discovered in Udipi in 1918 by two gentlemen who remained life-long devotees. During this period Nityananda traveled a great deal. He also spent time in contemplation at Guruvan, the jungle where he was found as an infant. For a time he stayed a few miles nearer the sea at Kanhangad, starting several substantial building projects and working on the rock-cut caves for which the area is famous. By now he was quite well known and an ashram was developing around him. Today we find temples to his honor at both Guruvan and Kanhangad. In the 1920s Nityananda spent time in Mangalore. Nityananda had many devotees here and it was his custom to stay with a devotee family in the town. During this time, Nityananda allowed devotees to gather around him in the evenings and sit in silence. Occasionally, however, Nityananda would speak from a trance-like state, and eventually devotees began to copy down his words. The many different transcribers spoke different dialects and had varying levels of education. Sometimes his words were not recorded until after Nityananda had stopped speaking for the evening. Years later, these notes, in their various formats and languages were gathered together and compiled by a persevering devotee and published in the Kanarese dialect. The words of Nityananda were eventually translated into English. covered with a roof. In the center of the floor stood a round stone pillar called a lingham. Villagers would pour water over it and decorate it with flowers and kumkum, the vermilion powder used in worship and ceremonies. The lingham is the symbol of Shiva's pure potential. And because Nityananda was there, the sixty or seventy miles surrounding Ganeshpuri were transformed from a jungle to a place where the ground was cultivated and educated people came to live Nityananda was an avadhut. An avadhut is a great mystic who has risen above body-consciousness, duality and conventional standards. The term is described in one text as one who is free from the consciousness of the ego, roaming free like a child over the face of the earth. An avadhut does not identify with the body, mind or emotions. Such a person is said to be pure consciousness in human form. "Avadhuts know that birth and death are illusions of the body. They are no more identified with the body than ordinary people are with their garments. Avadhuts have no sense of "I." Viewing all with equal pleasure. No matter where they wander, they have no sense of duality. If food is available, they eat-but they do not ask for food. Those who offer them poison and those who offer them milk are the same. Those who beat them and those who love them are the same. Avadhuts recognize the universe as father, mother, family. They contain the entire universe and the universe is merged in them." Nityananda had no purpose in the world and no message to bring. Why he appeared is unknown to anyone except perhaps himself. He was born to the austerity in which he lived his life. Simplicity and detachment were his essential nature-not something trained for or contemplated. His greatness was completely natural to him. Nityananda never promoted a particular life-style, philosophy or perspective. He did not teach any method and he did nothing to establish an organization around him. People came to him and he blessed them, he uplifted them, he gave them whatever they were able to take from him. It was just that simple and that free. Nityananda brought tremendous peace and betterment to the simple people; the poor and the destitute were especially drawn to his simplicity and lack of judgment. As time went on, he touched the lives of countless people of all classes. He sought no one's approval or recognition. He lived in the jungle where people had to seek him out. Nityananda dedicated his life to the presence of the Divine and lived each day as a beacon of that presence. From his presence, miracles of healing, of understanding, of the bestowal of peace and joy flowed. The credit for these things he gave to God and to the faith and devotion of the seeker. He would say, "Everything that happens, happens automatically by the will of God." Therefore, everything was possible. Miracles occurred naturally around him because of his continuous state of perfect Self-realization. He was always in union with the inner Self, and the need for this union was at the heart of his teaching. Like ancient sages from many traditions, he said that anyone who merges the individual into the universal is enlightened. For more detail about Nityananda's life, see Nityananda: In Divine Presence, a collection of stories about Nityananda collected by Captain M.U. Hatengdi, one of his principal devotees, and Swami Chetanananda, and published by Rudra Press, the publishing division of The Movement Center.